Vintage non-sports trading card sets are trading cards featuring subjects with wide popular interest and entertainment content or, including licensed properties from movies or television. Many of the gum card sets feature gruesome battle scenes, automobiles, or historical figures (such as U.S. Presidents, inventors, or aviators). Dean's Cards buys and sells just about every pre-1970 non-sports trading card including sets from old television shows and movies. 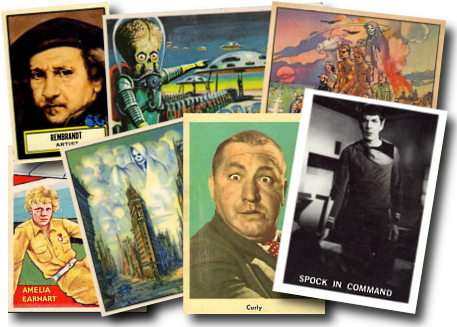 You'll find trading cards from sets as diverse as the Beatles, Civil War News, Mars Attacks, to the old Batman TV Series. We specialize in having the best selection of Non-Sports cards online and available for purchase. So it's fast, easy, and fun to complete your vintage non-sports set. Click here if you want to SELL your non-sports cards to Dean's Cards.